We are an alliance of legal organisations, charities, community groups, grass roots and other campaigning groups, trade unions and individuals who are united in our opposition to the government's proposed attack on legal aid and the criminal justice system. 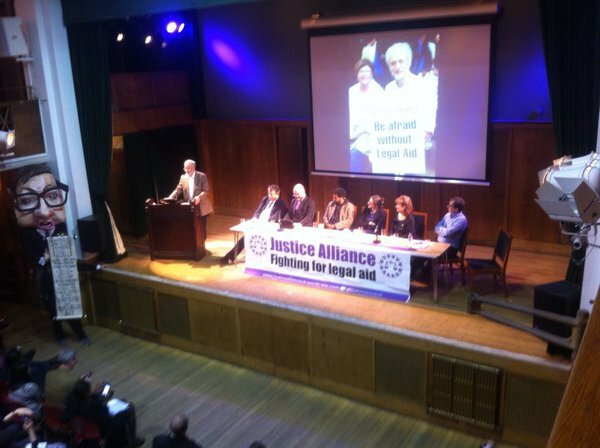 On 6th January the Justice Alliance kickstarted the new year with a promise to carry the fight for legal aid into 2016. Little did we expect that victories would come so soon, with the announcement on Thursday 28th January that the two-thirds reduction in contracts for police station duty work – the means by which criminal firms take on the majority of new clients – has been abandoned (see our previous blog post, as well as the Guardian’s coverage). A future of mass closures, conveyor-belt justice and advice deserts has been successfully averted. This follows reversals of other brutal and ill-conceived Grayling policies, namely the criminal court charge and the prisoner book ban. As Gove himself admitted, the sense in continuing with his predecessor’s plans grew ever fainter as “opposition to this model [was] articulated with increasing force and passion”, and that the 99 separate legal challenges to the tendering process created “real problems in pressing ahead as initially proposed”. Strengthened by the knowledge of what we can achieve collectively, we must remember what is still left to be done: insuperable evidential hurdles preventing victims of domestic violence accessing legal support, legal aid abolished or reduced beyond recognition in every major area of civil law, a newly-privatised probation service, the insidious residence test…the list goes on. To that end, we hope these audio recordings of the fantastic speeches delivered at Conway Hall – accessible via the links below – will help to provoke new ideas for action. January 31, 2016 in Articles.